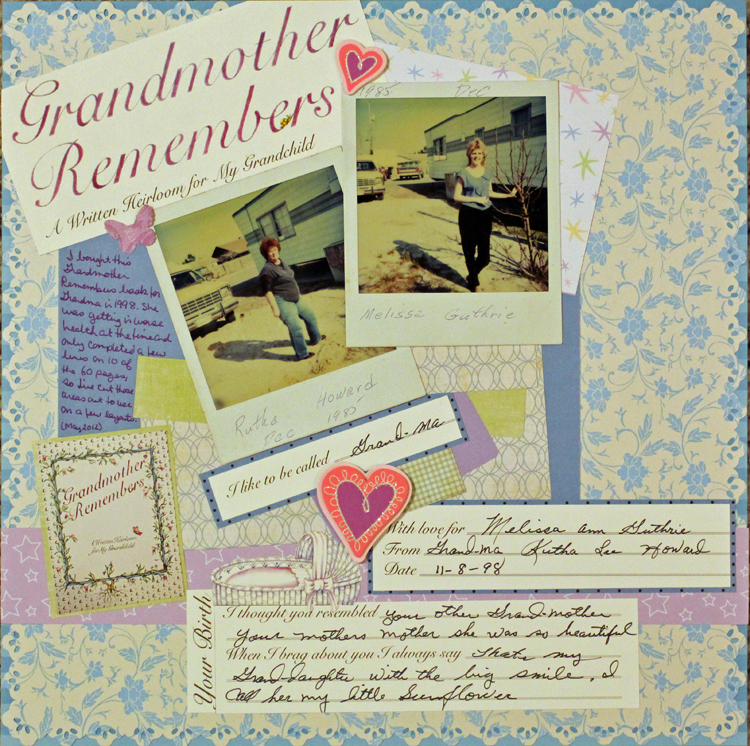 I completed this layout in response to a Library of Memories Community challenge to scrap about a beloved grandparent and include words from a card, note or letter. My journaling reads: I bought this Grandmother Remembers book for Grandma in 1998. She was getting in worse health at the time and only completed a few lines on 10 of the 60 pages, so I've cut those areas out to use on a few layouts. Even though Grandma only wrote a few things in the book I bought for her, each note is special to me. I love these two short notes she recorded in the section about my birth. My other grandmother passed away when I was only two-years-old and I don't have any memories of her, so I especially treasure this note that Grandma thought I resembled her. And one of the things I miss the most since Grandma's been gone these past 11 years is the way she always called me a sunflower and said I was like a ray of sunshine brightening up the room. I'm excited to add these bits of Grandma's handwriting to my scrapbook because I only have a few items that she wrote over the years. Do you have lots of samples of your grandparent's handwriting or do you, too, just have a few precious pieces? I only have a few photos....would love to have had some of my granny's handwriting. How precious, Melissa! I have cards and notes from one grandmother and recipes from the other. Wish I had some from the grandfather I was so close to. I don't believe I have anything with either of my grandmother's handwriting. Your layout is lovely. Pretty page, Melissa. What wonderful little notes for you to have from her. What sweet things she said about you! That is such a treasure. I think I have a few cards with both my grandmothers' writing on them..lovely LO Melissa!